I bet you all thought that I died! Nope, those rumors are greatly exaggerated. However, I have been dealing with a bit of 'real' life, what ever that is. In the meantime I have finished off my Leman Russ Executioner. Its been a real PIA to finish, let me tell you. 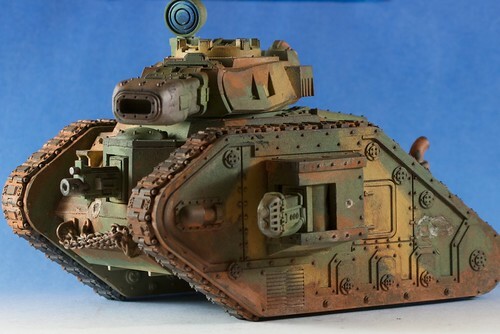 I changed the paint scheme in the middle of the project because I didn't like the tone of the colors in the original tank (see my last post for more details). Once that was done, the initial sealant stage hit a snag with "frosting" with the sealer. While I'd like to blame my sealer- the real blame should probably go to me- I didn't shake enough (in hind sight) and the humidity was near 100% that day here in the mid-west. Its a good thing that further work with the oil paints was already planned! In the end, I used many of the same techniques from the other tanks, plus a few from the Forge World Book. 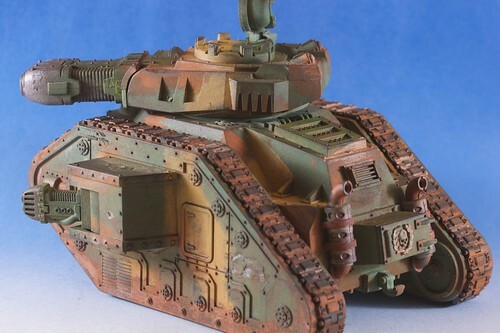 One of the things that didn't work so well was the weathering powders. One can use them straight out of the box with no fixative. Or one can mix it with paint thinner. This allows it to work closer to a standard paint, and you don't have to be nearly as careful with it as you would with the pigment. However, I found that the translucency that came so easily with the dry pigment was lost with the thinned pigment. You could regain that with multiple layers of very thin pigment, but that defeated the point of using dry pigments in my opinion. 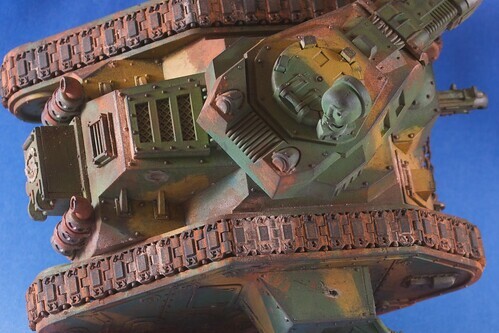 This is not a tank for a painting competition. I have a couple of more tanks for the Imperial Guard to paint. Those will be coming soon! I'm always reconsidering my color scheme. I think your instincts were right here. It looks great. Most people add color to the plasma coils. I'm curious why you didn't? Thanks Kevin, not you, the other one! Actually I do put colors on my plasma coils. However, I started to grow tired of this model after awhile and just needed to stop. Perhaps in the future, more color will be added but for the moment I'll use the model as it. The steel colored coils are starting to wear on me a bit. Yeah - that's a good-looking tank. Nice work, mate!